You know how it is—every year is the same old, same old when it comes to giving gifts—you do it with close friends, family members, and even your co-workers. 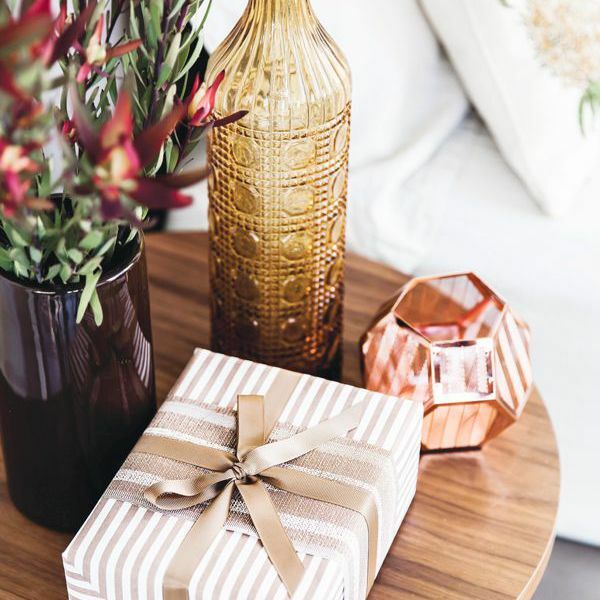 Other than simply wrapping up something special and handing it over, there are many creative holiday gift exchange ideas that add cheer to any wintertime get-together. So it’s time to inject some fun into gift-giving and receiving like when you were a kid and anxiously awaited your turn at grab bag. Since the holidays call for all different types of parties, we decided to cover our bases with suggestions for three groups: family/friends, co-workers, and the little ones. You can obviously get a little more inventive (or competitive) with those closest to you, while you probably want to keep it a little more toned down with your colleagues (even if your work BFF is in the mix). And when it comes to the kids, you need to focus on a longer game and nothing that will induce tears, obviously. Scroll down to see our favorite holiday gift exchange ideas worth trying this year. Now all you’ll need to do is go shopping. If you want to make everyone’s shopping a little more challenging, designate a theme that you all have to stick to. For example, it could be "Made in America," a theme that features items from the States or it could be "Anything Blue" where you have to buy something only in that color. The good news is that you can be as tame or as whacky as you’d like. After all of the gifts are opened, vote for who you think brought the gift that best fit the theme (a prize is optional). Sometimes all your loved ones aren’t in the same place. Have each person pack up a box with giftable items and cute notes (enough for every other participant) and mail it to whoever comes after their first name alphabetically. When someone receives a box, they should remove one gift and mail the rest (again, to the next person alphabetically), continuing the process until everyone has received a gift from each participant and all the boxes are empty. Instead of getting each other individual gifts, why not pool your money to get something awesome? It can be something as good as a spa weekend or a fire pit for the family. The best part? Choosing something that you can all do or enjoy together. Not everyone is as fortunate as we are, so it’s a wonderful idea to forgo your own gifts and give back. One suggestion is to all pick a name of someone in the group out of a hat. Once you’ve chosen, it’s up to you to choose a charity that is special to that person—say, the ASPCA for animal lovers—and make a donation in their name. At the “exchange,” you can all go around and share how and why you chose that cause. If you haven’t played this game, then it’s time that you did (PS: It also goes by the name Yankee Swap). Ask each person to bring a wrapped gift and pick a number. The person who draws a “1” will choose a gift and unwrap it. The person who draws a “2” will then choose to pick an unwrapped item or “steal” that gift. This competitive game goes back and forth until no one wants to take anyone else’s present. There are a ton of variations—so have someone brush up on the rules beforehand and share with the crew. There’s something still so special about a Secret Snowflake, especially when your office is large enough and the team knows how to keep a secret (yes, that’s key). To make it a little more informative, have each person fill out a tiny questionnaire about their likes and interests so their “Secret Snowflake” has some ideas. At the party, have each person guess who their Snowflake is. Designate a price cap, and ask everyone to bring in a present of their choice, unwrapped. Have a leader give everyone the same amount of Monopoly money. Each person goes up to the front to display the gift they brought, which is then “bid on” by the rest of the party guests. Can you guess how this works? Whoever has the highest bid gets to take home that gift. You may have played this game at a bridal or baby shower, but it really is so much fun. One guest comes up with questions in advance that need to be answered with “left” or “right.” Each person starts with their wrapped gift in their hands, and as the questions are answered, the items are passed back and forth. When there aren’t any questions left, the present still in your hands is yours to open—and keep. Oh, how we miss musical chairs. Set up a row of chairs or pillows for the little ones and put a wrapped gift near each seat. Choose music kids love, and stop the music sporadically, forcing them to take the seat nearest them. At the end, each child will be given the gift under or nearest to their chair or pillow. Side note: Make sure parents stick to the price cap so there aren’t any tears. The oven mitts game is basically the equivalent of bobbing for apples during holiday time. Have the kids sit in a circle; give one child a wrapped gift and have them attempt to open it with oven mitts on both of their hands. Meanwhile, have the other children pass a die around the circle—when someone rolls a six, it’s their turn to try to open the gift. How do you win? If you can open the gift with the mitts on, then it’s yours. Do you have any fun gift exchange ideas you’re going to try out this year? Share with us in the comments, and then read about the best ways to stay fit during the holidays.